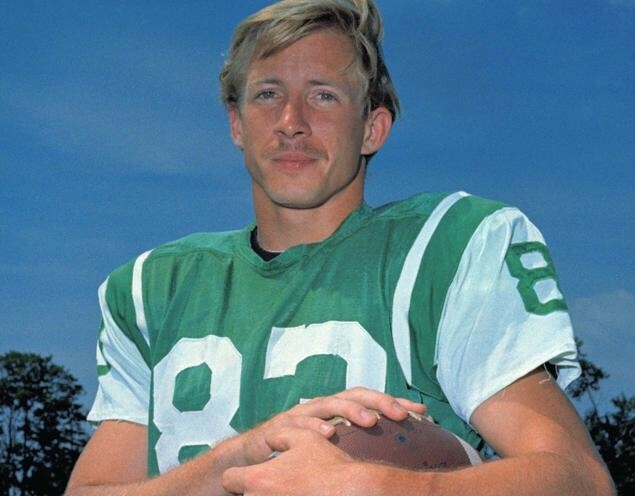 Former NY Jets wide receiver George Sauer Jr. died on May 7 in Westerville, Ohio at the age of 69. According to his sister and only survivor, Dana Keifer, Sauer died of Alzheimer's disease. Sauer is best remembered for his performance in the 1969 Super Bowl when the Jets played the Baltimore Colts. After Don Maynard was injured during the fame, Sauer replaced him and, catching eight passes from quarterback Joe Namath, was able to help the underdog Jets beat the Colts 16-7. Sauer was a four-time All-Star in the American Football League and played in the AFL and National Football League for the Jets from 1965 through 1970. He appeared in 84 games and caught 309 passes for 4,965 yards and 28 touchdowns. He retired at the end of the 1970 season at the age of 27 from the NFL, saying he became disillusioned with the lifestyle of a professional football player. "When you get to the college and professional levels, the coaches still treat you as an adolescent," he said in an interview in 1971 with the Institute for the Study of Sport and Society, according to the Times. "They know damn well that you were never given a chance to become responsible or self-disciplined. Even in the pros, you were told when to go to bed, when to turn your lights off, when to wake up, when to eat and what to eat."